MALOLOS CITY—Lindsay Stalzer dug deep into her well of experience to power Petron to a 25-21, 25-15, 25-21 victory over Generika-Ayala Tuesday in the Chooks to Go-Philippine Superliga Grand Prix at the Malolos Sports and Convention Center. Playing in her fifth season, Stalzer sparked a fiery uprising in the crucial stretch of the third set to tow the Blaze Spikers to another impressive victory in this prestigious club tourney bankrolled by Isuzu, Rebisco and UCPB Gen with ESPN5 as official broadcast partner. With the win, the Blaze Spikers tightened their hold on the lead with 5-0 win-loss card, while the Lifesavers remained winless in three starts in this league that also has Asics, Mikasa, Senoh, Grand Sport and LGR as technical sponsors. The 32-year-old Stalzer, the former Bradley University star who led Foton to a pair of PSL crowns in 2014 and 2015, registered all of her 20 points from the attack zone, while her spiking partner in fellow American Hillary Hurley chipped in 11 kills, two aces and a block for 14 points. 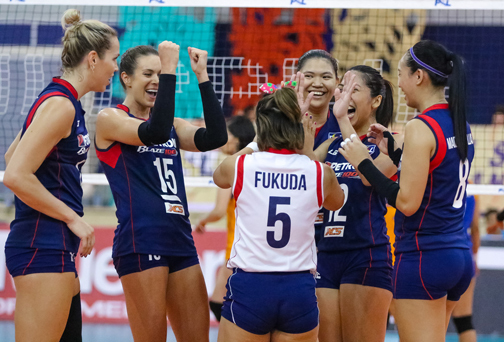 Petron controlled the spiking department, 46-31, and had more blocks, 5-3, in this match that drew a good-sized crowd and lasted for 79 minutes. “We fought back from being down and I’m very happy with the composure our team got today,” said Stalzer, the former Most Valuable Player awardee. After dominating the first two sets, Petron found itself in trouble as Generika-Ayala entered the first technical timeout with a wide lead, 8-2. The Blaze Spikers refused to quit as they pounded hard on the Lifesavers’ erratic reception and a couple of unforced errors to knot the count at 16 in the second technical timeout. The Illinois-native shattered an 18-all deadlock with three sharp smashes to capture a 22-18 advantage. Remy Pala joined the scoring parade with a running hit from the right wing followed by a block kill to rip the game wide-open, 23-19. Symone Hayden nailed 14 points while Darlene Ramdin and Angeli Araneta contributed 10 markers apiece for the Lifesavers, who are still in their quest for their first win under the mentorship of Sherwin Meneses and Parley Tupaz.